Ins & Outs #1 | Chelsea B.
I've never done a post like this, and I thought it seemed kind of fun. It might become a regular thing here on the blog. We'll see. 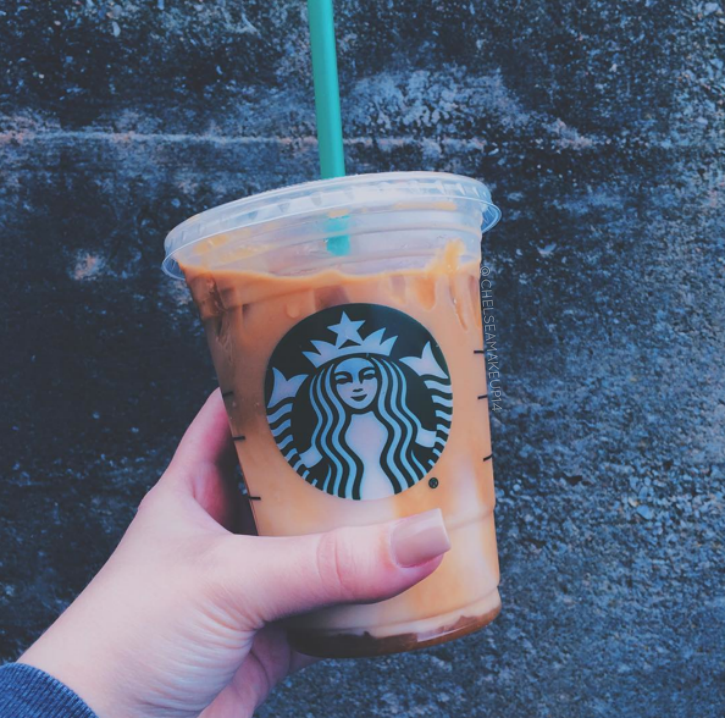 -Starbucks Iced Caramel Macchiatos: We all know that I have an unhealthy obsession for all things coffee and caffeine. Iced caramel macchiatos are my jam right now! I just order mine like normal - no extra shots of syrup or espresso. -Dancing: I've been loving learning dance routines to current popular songs! I've always wanted to be a dancer. When I was in first or second grade, a lady that my Mom was friends with took her daughter to some dance thing that was in my town. I signed up for it, but it wasn't what I thought it would be. It was too...I don't know. It just wasn't me at the time because I was VERY shy growing up. Well, now I wish that I would've actually liked the dance classes back in the day and that I wouldn't have convinced my Mom to stop taking me. *sigh* But I'm learning all these new routines and I'm having so much fun with it! I'm incorporating the dances into my workout routine - it's a great way to get in some extra cardio and have lots of fun. -Writing: So I've been working on many different book ideas for the past three or four years now. I have this idea for a series that I want to do, and I have a few of the books rewritten. Yeah, I wrote them before but I decided that I wanted to rewrite everything because I wrote the first book when I was 15/16, and I'm like because I'm almost 20 I can kind of make this book a bit more "grownup" and not let it come across as a book that a teenager wrote. -My Ears Being Pierced: This is super random, but I am over having my ears pierced. Maybe it's because I don't have that many cute earrings, I don't know. It's so funny though because I remember being 8 or 9 and begging my parents to let me get my ears pierced. But right now, I'm over it. -Breaking Out: I'm so over my skin breaking out! I think it's because I've been super stressed and exhausted these past few months. I've been wanting to try different skincare products but I just don't know what to try and I just don't know right now. -Decorating My Bedroom: I want to redo my bedroom because I have a brand new bedroom! Well it's not brand new, but I've gotten permission to take the downstairs guest bedroom as my own bedroom and move the guest bedroom into the office when we move the office. My Mom and I were talking that we don't really have people stay at our house that much, so we don't exactly need a guest bedroom. Anyways, I just don't know what I want to do with the space. I need to decide on a paint color because it's currently green and that's just not gonna work. I also have to figure out how to make my bedroom work as my office too because I want my own office space and not have to share with my Dad. No offense Dad if you're reading this. I guess I'll just keep pinning ideas. -Allergies: Is it just me or does it seem like allergies are extra horrible this year? My poor nose hurts so bad from having to blow it so much. Also, does anyone get itchy during allergy season? I feel like my skin is super itchy, even though I've been taking my allergy medicine. Of course I have been petting my parents cat a lot lately and I'm super allergic to cats so that might be it. 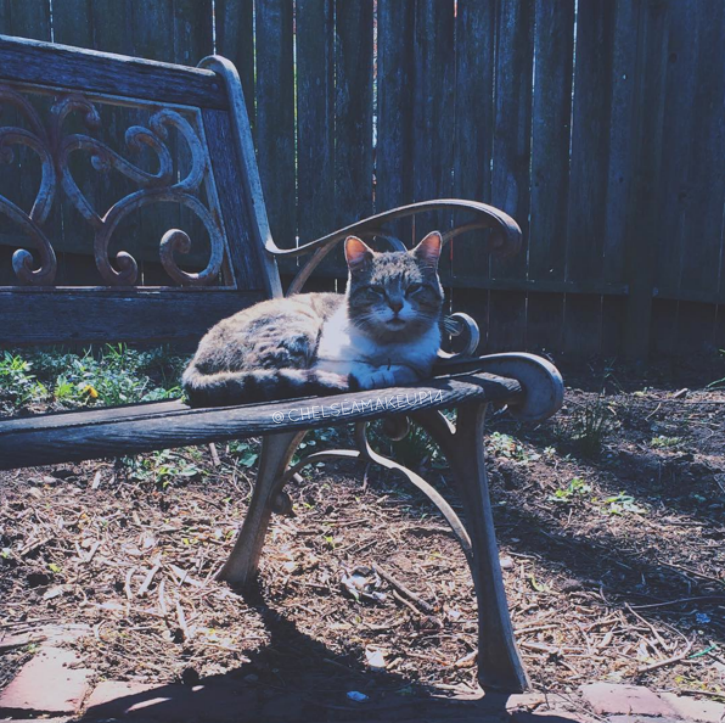 Oh and here's a cute picture of my parents cat from yesterday!